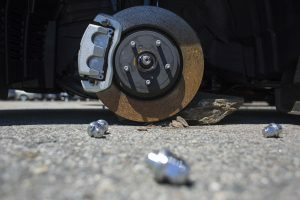 Dealers in Portland and Saco invest in more security after vehicles are stripped of tires and rims and left resting on their brake rotors or propped up on rocks or milk crates. Matt Almy, general sales manager at Berlin City Toyota in Portland, examines damage to two Lexus RX 350 luxury SUVs on Tuesday. Rims and tires were stolen from nine vehicles on the lot Sunday night. A similar crime took place at Prime Honda in Saco earlier this month. 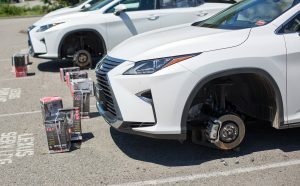 Two car dealerships in southern Maine are investing in more security after being hit by thieves who stole tens of thousands of dollars worth of wheels and tires from gleaming new luxury cars, leaving the vehicles stranded on milk crates or chunks of rock, managers at the dealerships said. Lug nuts litter the ground next to a Lexus RX 350 luxury SUV at Berlin City Toyota in Portland this week. The value of the rims and tires stolen from Berlin City and the tire pressure monitoring sensors inside them was estimated at $40,000. Authorities said there is no security footage of Sunday night’s crime in progress. 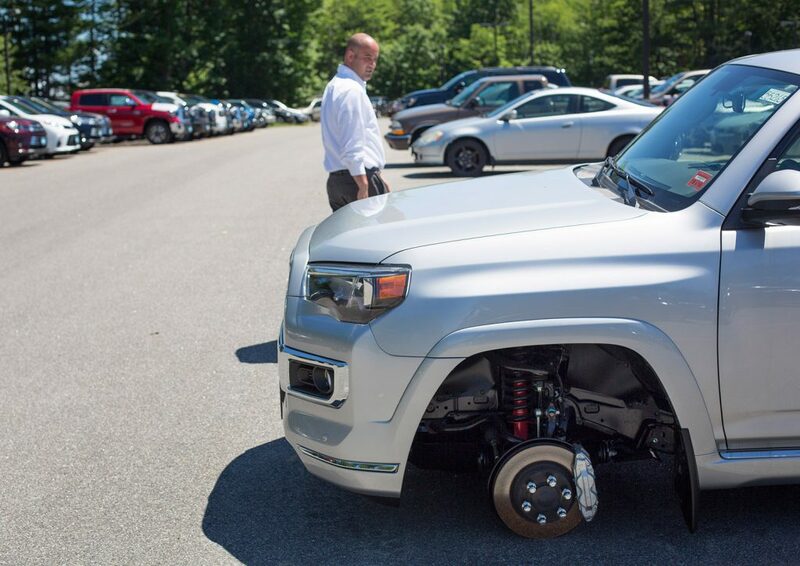 The thefts at the dealerships – Berlin City Toyota in Portland and Prime Honda in Saco – resulted in the loss of about $70,000 in wheels and tires, and thousands more in damage to the vehicles. The most recent theft occurred Sunday evening at Berlin City Toyota, which also sells Lexus vehicles. Thieves stole wheels from eight new Lexus vehicles and one Toyota. They also stole a 2019 Toyota Avalon. Matt Almy, Berlin’s general sales manager, said the keys had been left inside the Avalon. There was no security footage in either case, but managers at both dealerships said they were installing cameras to cover the areas where the thefts occurred. After the thefts, the vehicles were left sitting with their brake rotors resting on the asphalt and on old tires. In some cases, the vehicles were held up by basketball-sized rocks wedged under their bodies. Shiny chrome lug nuts were scattered around the cars. The wheels and tires stolen from Berlin City, along with tire pressure monitoring sensors inside them, are estimated to cost about $40,000, Almy said. “It appears they targeted vehicles with expensive wheels,” he said. In most cases, the wheels had specialized lug nuts with irregular patterns designed to prevent anyone from taking the wheels off the vehicle without a corresponding key. But the wheel lock keys were stored in the vehicles’ glove boxes, Almy said, so the thieves broke windows to gain entry, further damaging the cars, he said. Matt Almy, general sales manager at Berlin City Auto Group in Portland, walks across the lot Tuesday. Rims were stolen from nine vehicles on the lot on Sunday night, including this 2018 Toyota 4Runner Limited SUV. Police in Saco and Portland said there have been no arrests in either case, but Almy said some facts point to a Providence, Rhode Island, connection. A stolen minivan was found abandoned near the dealership and “in the glove box were a bunch of repair bills from Providence, Rhode Island,” Almy said. 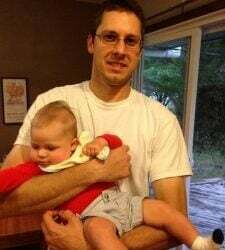 Plus the stolen Toyota Avalon turned up Monday in Providence – sitting on cinder blocks with its wheels gone. In addition to the cost of replacing the wheels and tires, the dealer also is facing the cost of repairing the broken windows and the body damage sustained when the cars were left on the rocks, in some cases leaving bulges and creases in the bodywork that will be expensive to fix. The dealerships also expect to take additional losses if they sell the vehicles at a discount because of the damage they sustained. Lug nuts rest on the ground next to a Lexus RX 350 luxury SUVs at Berlin City Auto Group in Portland on Tuesday. 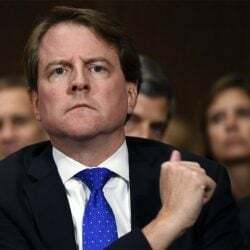 The similar incident occurred at Prime Honda in Saco on June 10, another Sunday, said Dennis Steeves, the dealership’s general manager. Workers at the dealership arrived Monday and found 10 vehicles on plastic milk crates. The cars were mostly Honda Accords and Honda Pilots, Steeves said, and all had their wheels and tires stolen. 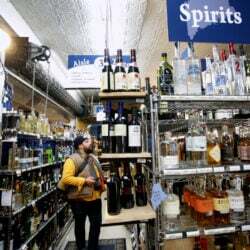 The cost of the stolen merchandise is estimated at $30,000, said Steeves, who has heard anecdotal reports of similar thefts in Massachusetts, Vermont and New Hampshire. A dealer manager at Quirk Chevrolet said the business was the victim of a similar theft last October, when workers arriving on a Monday found several trucks with missing wheels. The theft of car parts can be lucrative. In the past, police have combated thieves who target catalytic converters, the devices integrated into a vehicle’s exhaust system that help convert polluting exhaust fumes into benign substances. The converters contain exotic and precious metals such as platinum, palladium and rhodium, which can be recycled for cash.